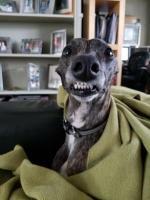 Whippet Needs - Can Whippets Stay Home Alone? Can Whippets Stay Home Alone? Whippet needs and living arrangements. Can whippets be left home alone? Dogs are social animals and need the presence of their human companions to thrive and live a happy and balanced life. Whippets, probably more than other canines, need and crave warmth and the presence of their humans but even hound owners sometimes have inescapable commitments that exclude their dogs. The best solution to this conundrum is a dog door. A door that connects an enclosed outdoor yard to the kitchen or a restricted indoor area, will give you peace of mind about the safety and comfort of your pet while you are away from home. Whippets with their short coats and very little body fat, have no protection against the cold. It would be cruel and dangerous to leave our little hounds out in extreme cold weather. By another hand, although your whippet will do his best to make you forget, even he will eventually need to venture out for his bodily functions. So, if you need to leave your pet home alone while you are at work, you will be faced with a dilemma: let your whippet freeze outside or leave him inside and find a soiled house upon your return. Crate training can help but no dog can stay in his crate for too many consecutive hours. It is unrealistic and unfair to expect your dog to wait for a full working day to relive himself. Giving no alternative means to force your whippet to soil the house or the crate. Messing inside can quickly become a habit very difficult to break. At this point house training will become very difficult or impossible and you’ll find yourself with an unmanageable pet. Punishment? Go ahead, punish yourself because you are the only one responsible for the problem for ignoring your whippet needs. A dog door between a restricted area inside the house and a fenced area outside, like a small garden or a terrace, is the best solution to this situation. Most modern doggy doors can be locked when necessary and are efficient enough to keep the cold out. A medium sized door is all a whippet needs to get through but not big enough for intruders to get in. 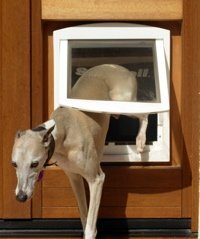 Most whippets will be comfortable with a door about 20 cm wide and 30 cm tall with the top of the flap mounted at about 55 cm from the floor. Your whippet will easily learn to use the door with a little training. First entice your pet with food while keeping the door open. Then, when he becomes more confident let him test the door while leaving food on the other side. Reward verbally when he tries to get through and praise enthusiastically when he finally succeeds. Congratulations, you set the basis for an easy and enjoyable life with your whippet!